Welcome to this week’s version of The SCOOP. There are updates on events from the past week and events that are coming up. 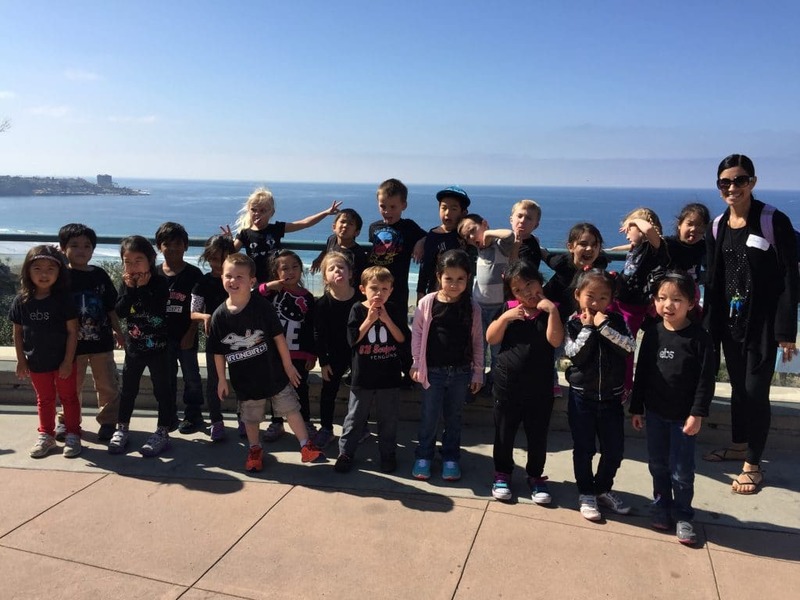 As you all know we went to the Birch Aquarium this week to learn about sea life. 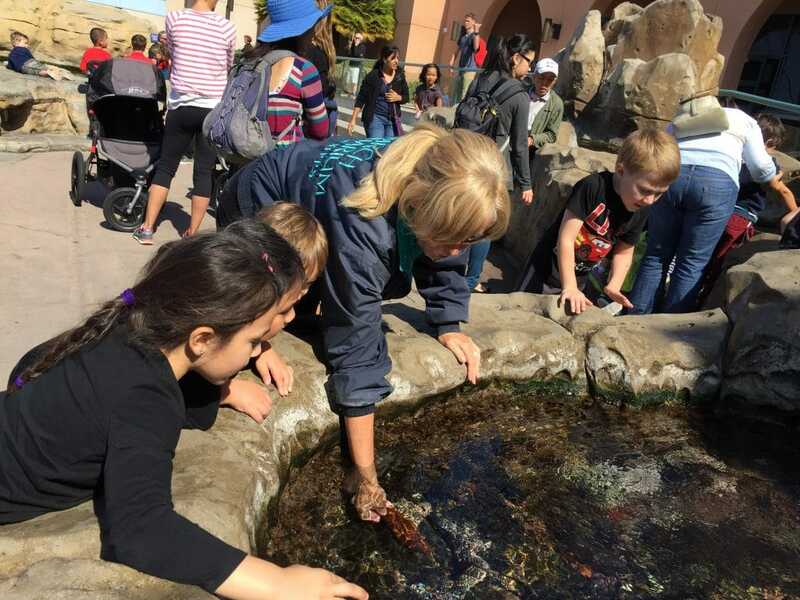 We started our trip out at the fountain to wait for all our carloads to arrive as well as explain the rules of the aquarium. 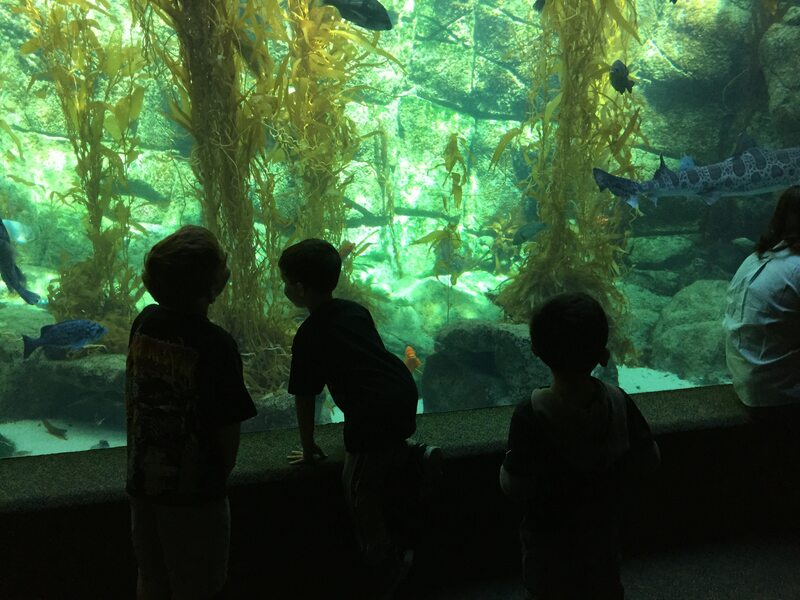 At first we headed into the aquarium and looked at the beautiful sea life in the large aquarium tanks. Then we went outside and looked at the tide pools. We were able to touch many different animals and see the example of how the tide works. We went back to the front and ate our lunches. Finally we were able to go into our class. 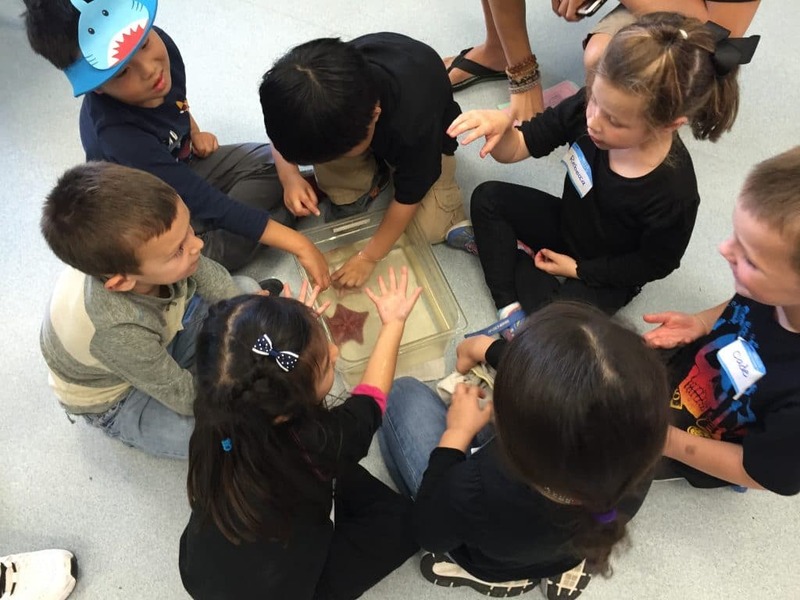 Our teacher, Art, talked to us about animals in the tide pools and about adaptation. 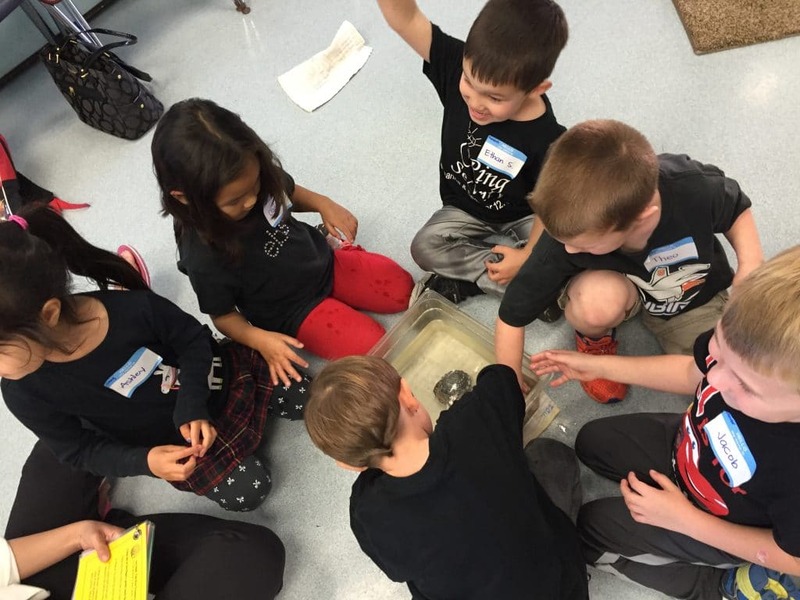 The students got into 4 groups and each got a turn to touch and observe sea snails, hermit crabs, sea stars, and a sea urchin. 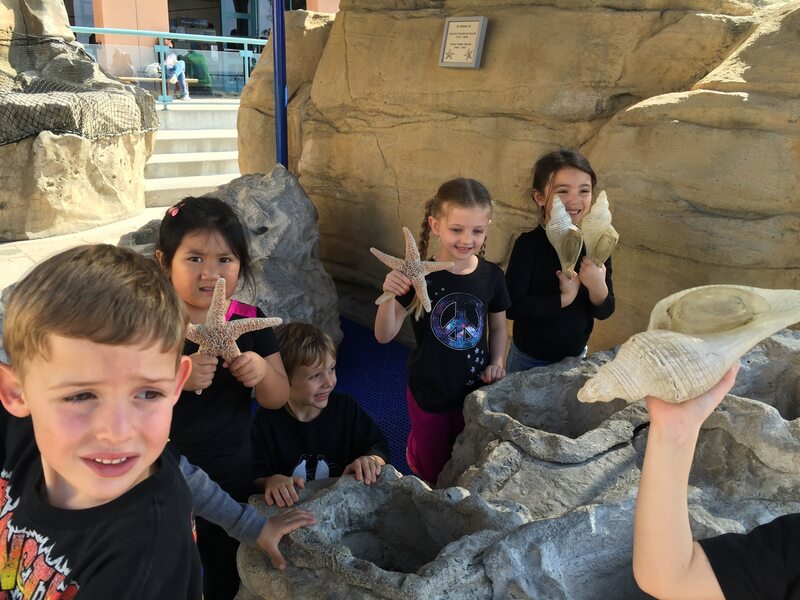 After the class we got a little time to explore outside the aquarium! We had a great day! Thank you to all our parent/grandparent chaperone/drivers! “SOUND IT OUT” – when to use it? This phrase was used a lot when I was a kid to try and help me get better at reading….and I can’t say it helped me much then as a reader nor does it help me now. The truth is that it isn’t a phrase we want to use when supporting reading. When we are reading, we don’t want to go down to the word level, but rather focus on the meaning of the text first. When your child gets stuck on a word and pauses or looks at you for help, or may even say, “I don’t know that word,” a more helpful phrase to use would be…”What would make sense?” This is typically the first triage term I use when giving reading aid to a child. Look at the picture. What is happening? Try reading that again (think of it as running start while thinking about meaning and looking at the picture). Struggle, be okay with it. Struggle is good as long as it doesn’t get them to a frustrational. Hold off on jumping in to tell them the word, try a few of the aids above first and let them be the problem solver so they can use it independently in the future. (if there are many words that are causing struggle, then likely the text is too hard and will lead to frustration (in this case….change books). As fluent readers, we always want to think about the meaning of the text first. Just as you and I read important documents from our doctor or boss, knowing how a word sounds isn’t so important or helpful or even necessary as understanding what the document says. Making meaning from what is read is the goal of reading any text. 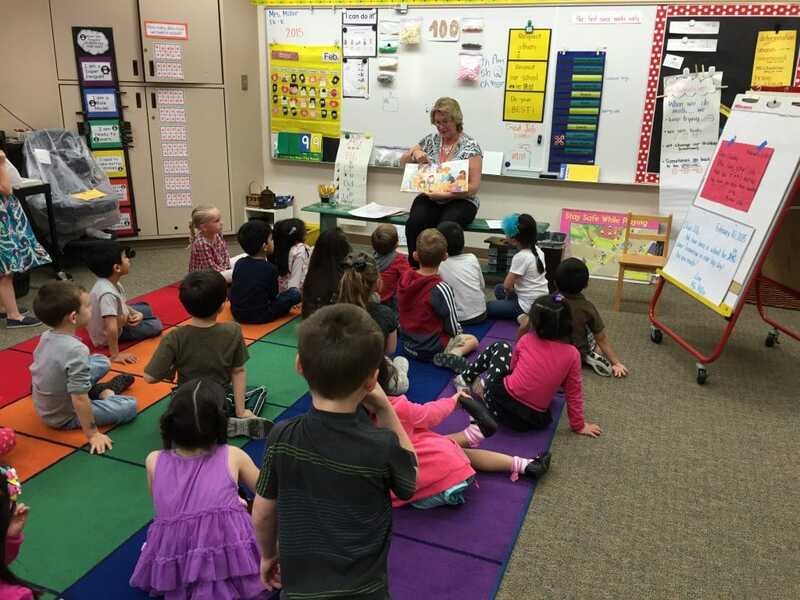 Using “sound it out” in reading can be counter productive as it sends the message to early readers that reading is about sounds when reading is about the meaning of the text. Happy Chinese New Year! 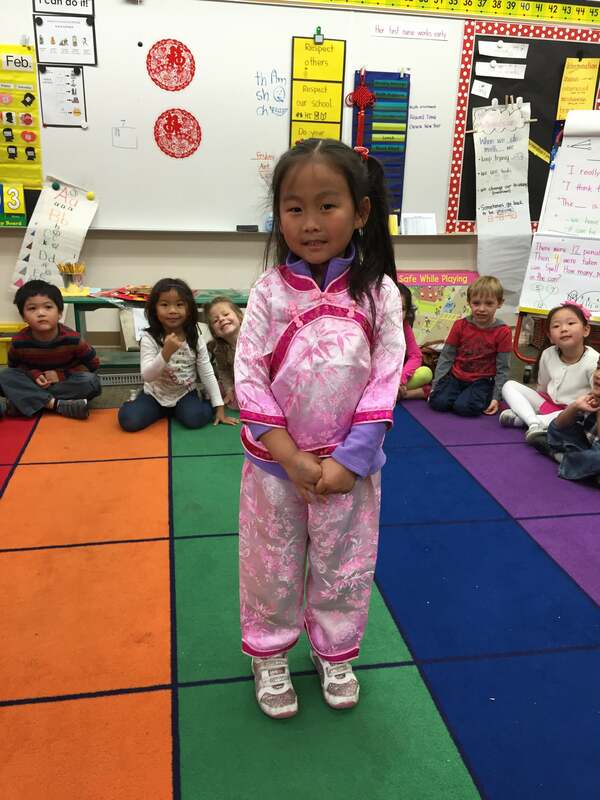 On Thursday, Amy Ju came in to talk to the class about Chinese New Year. 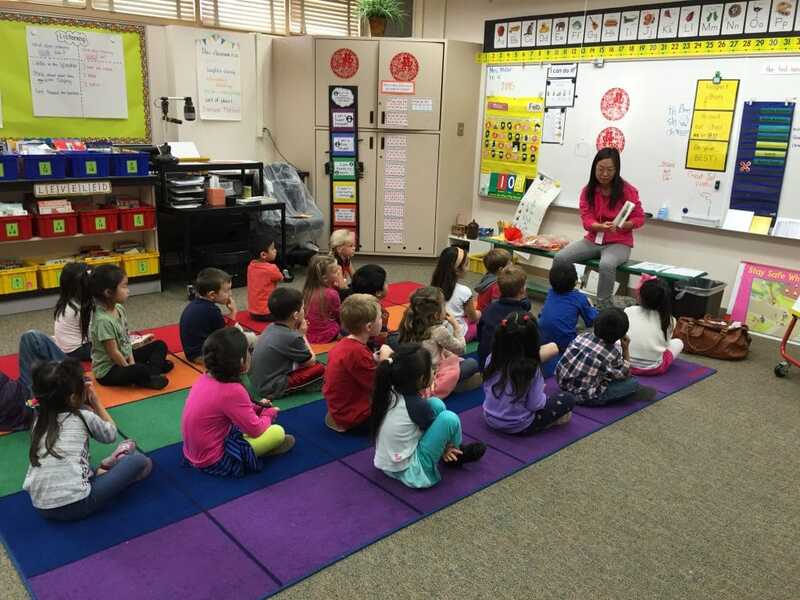 She read them a book all about Chinese New Year. She explained the value of the color red and how it means good luck and talked about the year of the ram. 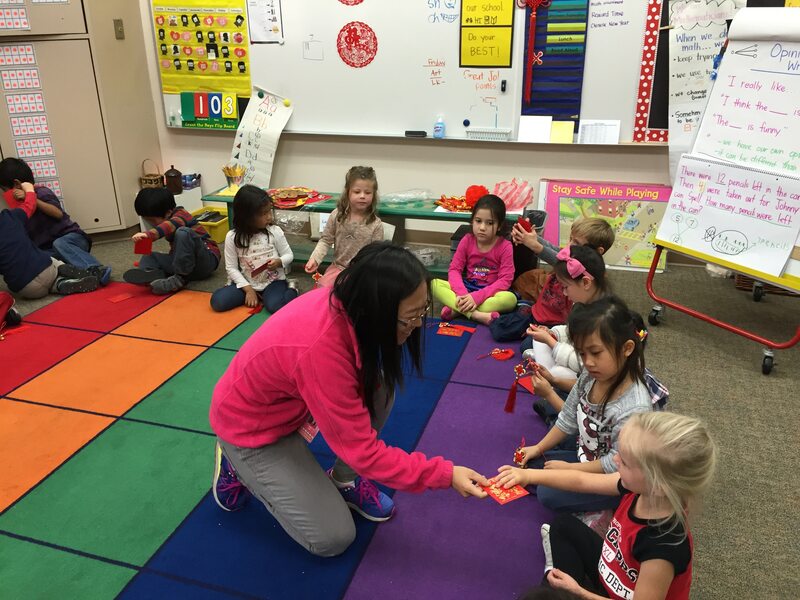 Amy also told them about the many traditions of this holiday in which kids get a gift from older generations, and she gave each student a gift in a red envelope along with a beautiful red knot ornament! 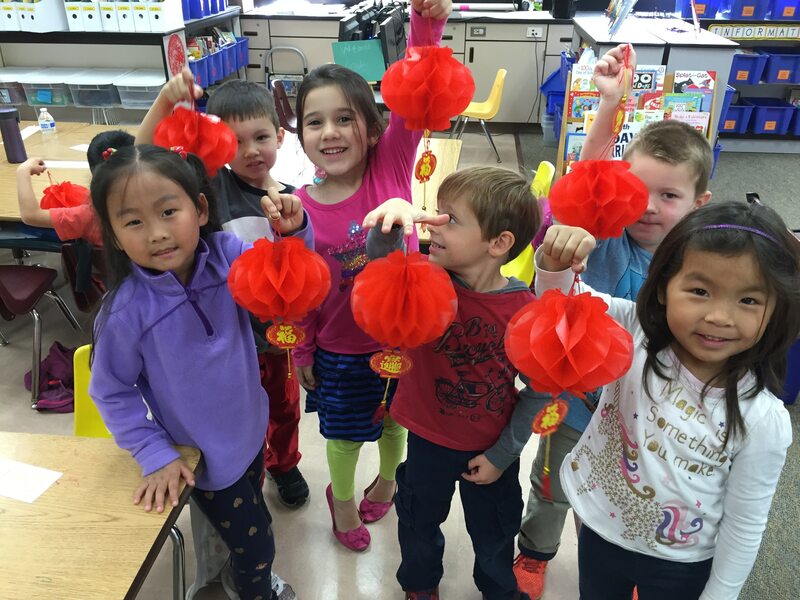 The students each got to put together their own red lantern which they also took home. 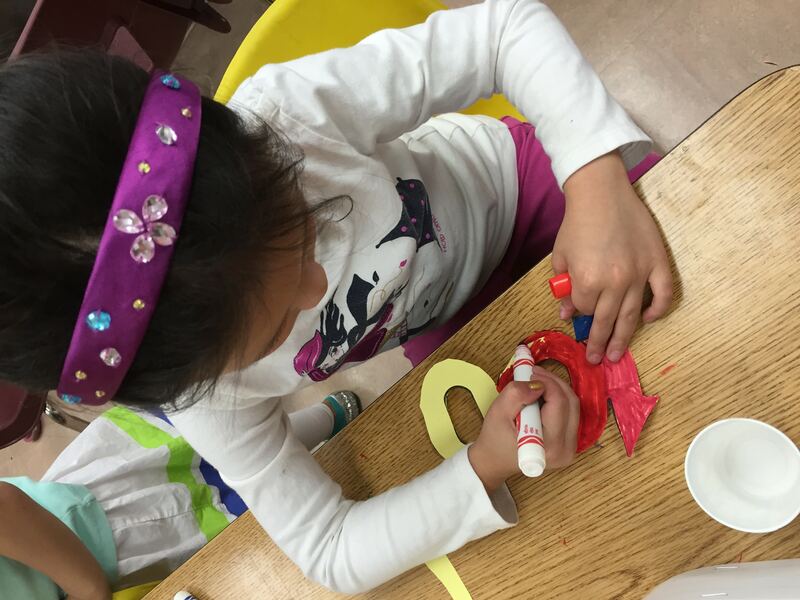 Amy also decorated our class with red decorations. She also had her daughter put on her special outfit to celebrate the new year so we could all see it. Finally, she brought in a mini dragon and played traditional music. 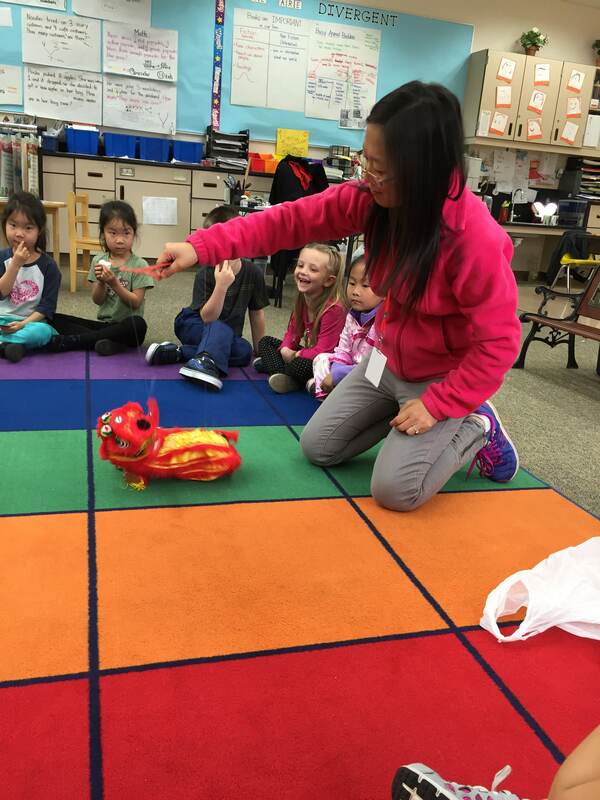 Each child got to try on the dragon puppet to make him dance to beat of the music. 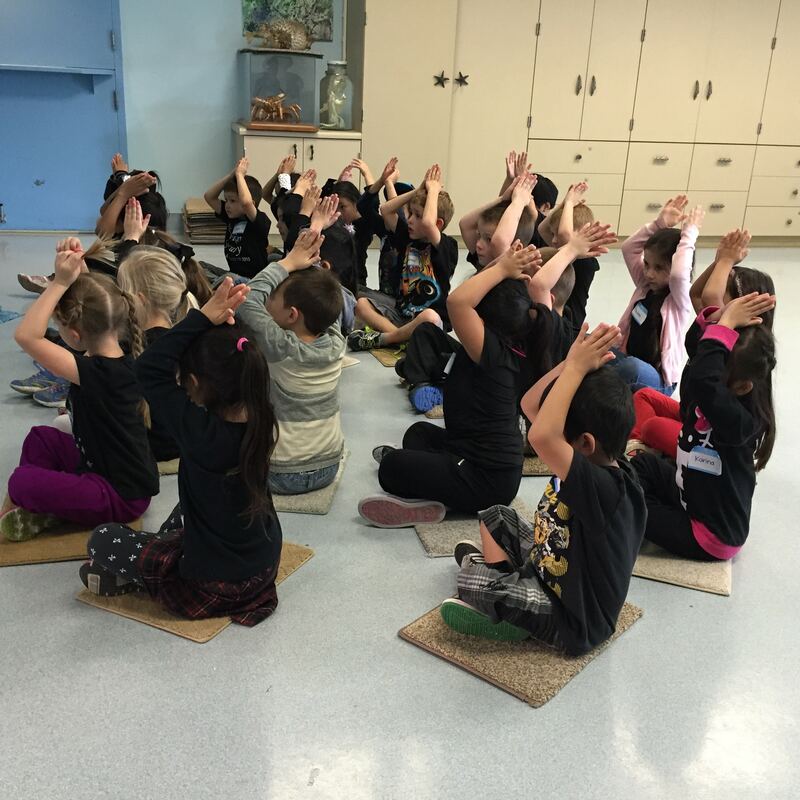 We are so grateful for all we learned and for the generous gifts. Thank you Mrs. Ju and HAPPY NEW YEAR! 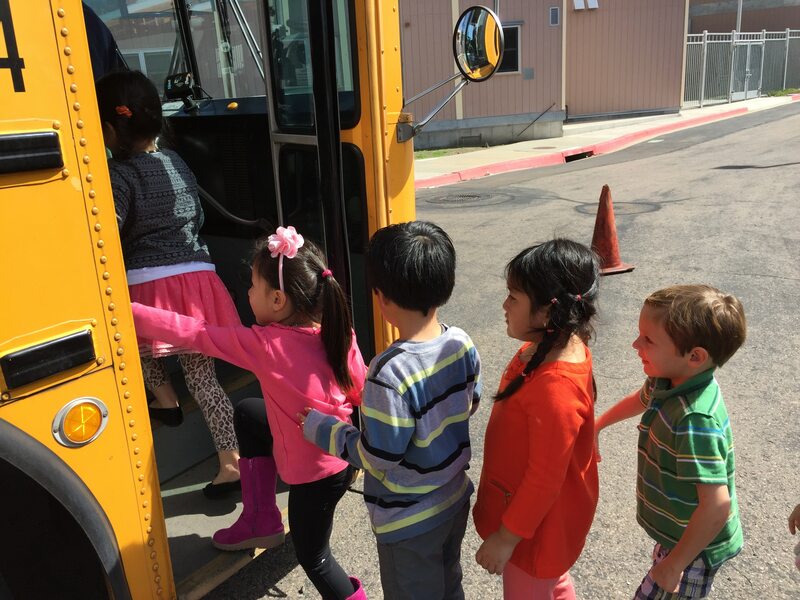 Wednesday many of the students experienced their first time in school bus. 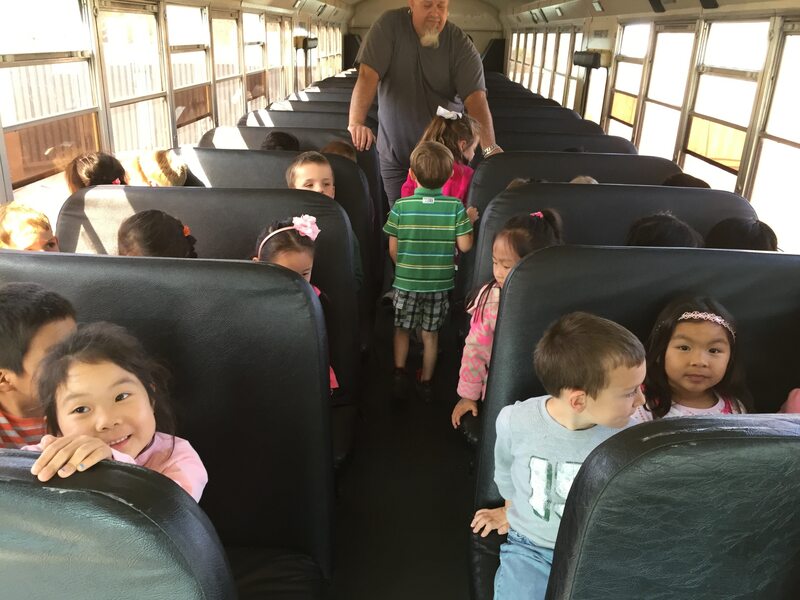 Our school bus guide, had the kids sit outside of the bus to explain the outside safety of the bus (standing far away from the front, back and side if you are ever around a bus). Then all the students got to go in the bus and sit down. He had them sit 3 to seat (back against the seat) and explained the rules on the bus, the emergency exits, how to open the door and use the radio in case something happened to the bus driver. Finally each child got to drop out of the side door to practice getting out from an emergency exit. They had a great time, learned a lot, AND were very proud of themselves for being brave in trying something new! Crystal Meginness has volunteered to be our Box Top Representative for Room 206! Hooray! 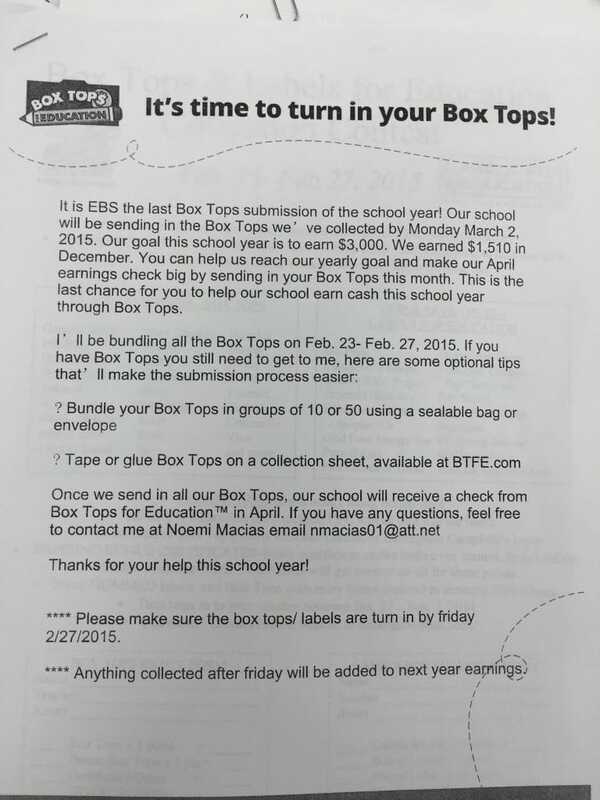 Just a reminder Crystal must turn in all Box Tops by next Friday, February 27th. Please be sure to turn yours in before then so can be counted for this school year! Due to all the activities and experiences in these past two weeks, I delayed handing out the first posters that I spoke about in the blog a few weeks ago. This Monday I will send home the first posters (1 TK Poster and 1 K poster). Have fun, be creative, and remember that the focus is on the presentation (listening and speaking skills). As a reminder, all the directions and will be sent home in the folder with your child. Mission Federal Credit Union at School for deposits! Parent Teacher Conferences (Round 2) are coming up soon. Yesterday, I sent out letters to families in which I am requesting a conference. 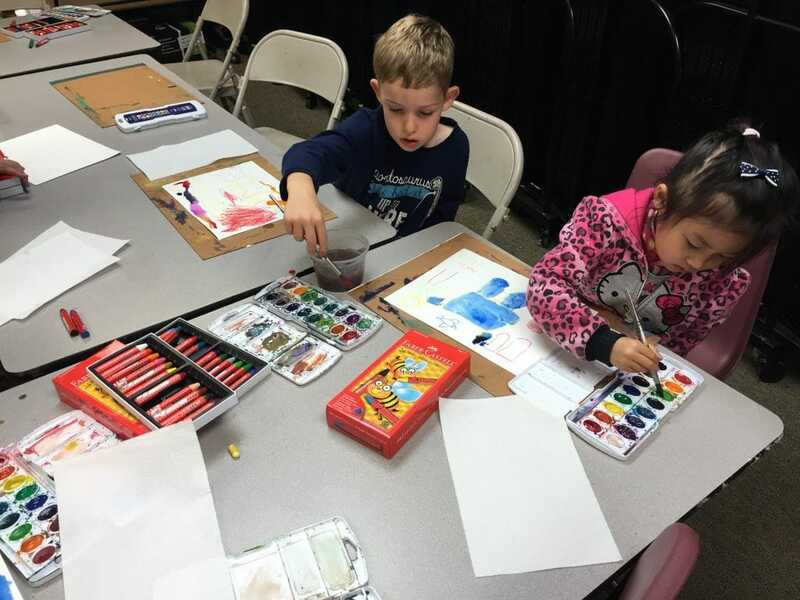 If you did not receive a yellow sign-up letter to have a conference in your child’s folder, this means that your child is at or above grade level and a conference is not needed at this time. If a conference is not necessary at this time, a copy of your child’s report card and some student work will go home on Friday, March 6th. If you did receive a yellow sign-up letter yesterday, please return this by Friday, February 20th with your date/time preferences. A confirmation notice will be sent home with your child to confirm your conference date/time. Bring your “happy” attitude and get ready to learn and have fun! 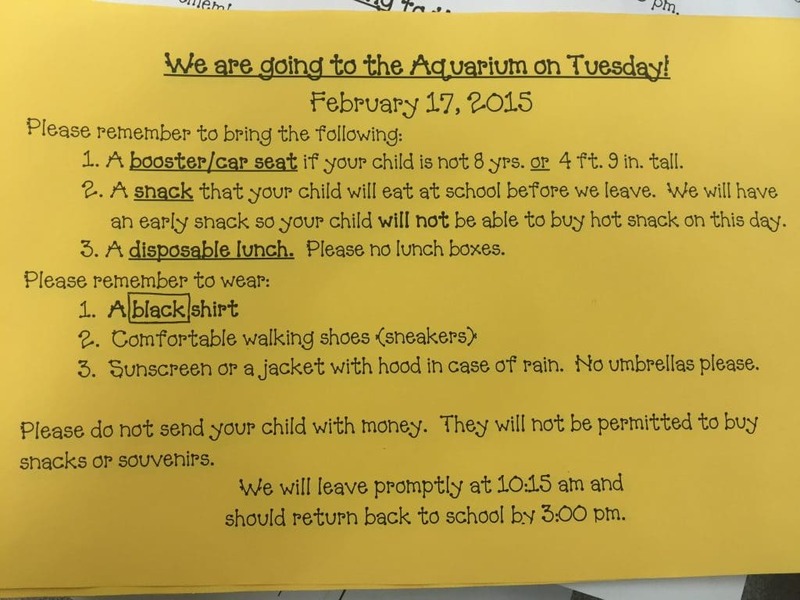 A yellow/orange colored note went home on Thursday with all the information regarding Tuesday’s field trip. The flyer shows everything that is needed to be ready for the trip. See a copy of the flyer below in case you missed it. Keep in mind appropriate clothing layers depending on the weather and sunscreen as we are enjoying the sunshine and heat this February. We are still missing the field trip fees from a couple students. 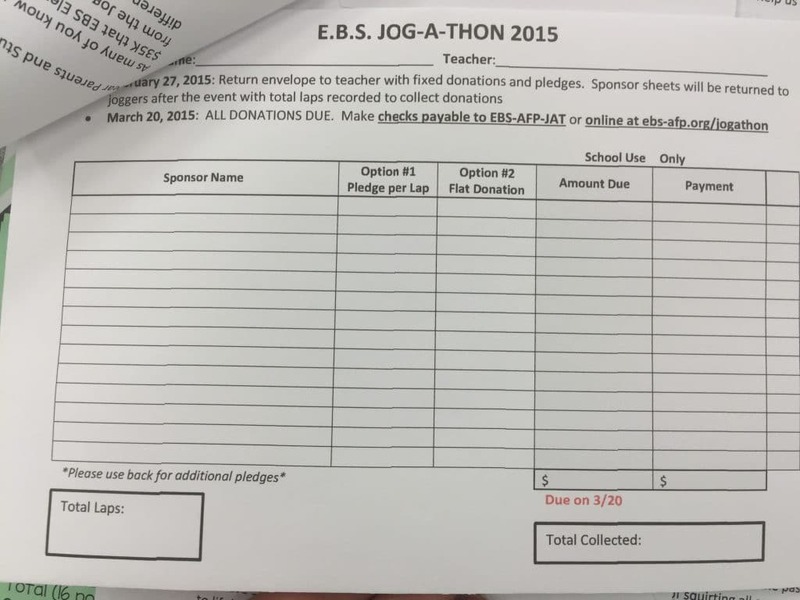 If you haven’t turned yours in, please send the $8.25 on Tuesday. See a picture of the flyer that home this week. 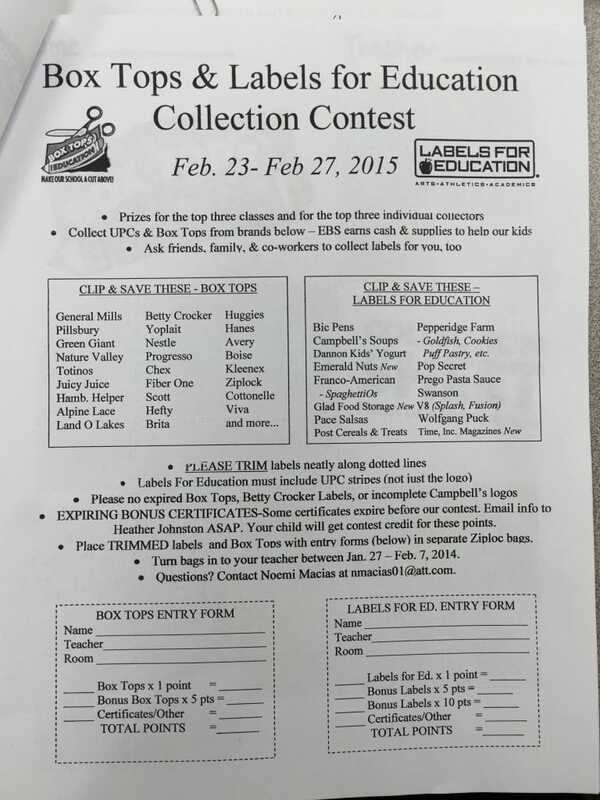 This flyer has the corrected dates for Box Tops collections. Our yearbook representatives are collecting pictures to show a snapshot of our entire school year. Please upload any pictures you have of our school year on the Shutterfly website. This allows them to have access to these pictures for the yearbook as well as allowing other parents to access these pictures to make personal books, gifts, etc through Shutterfly. 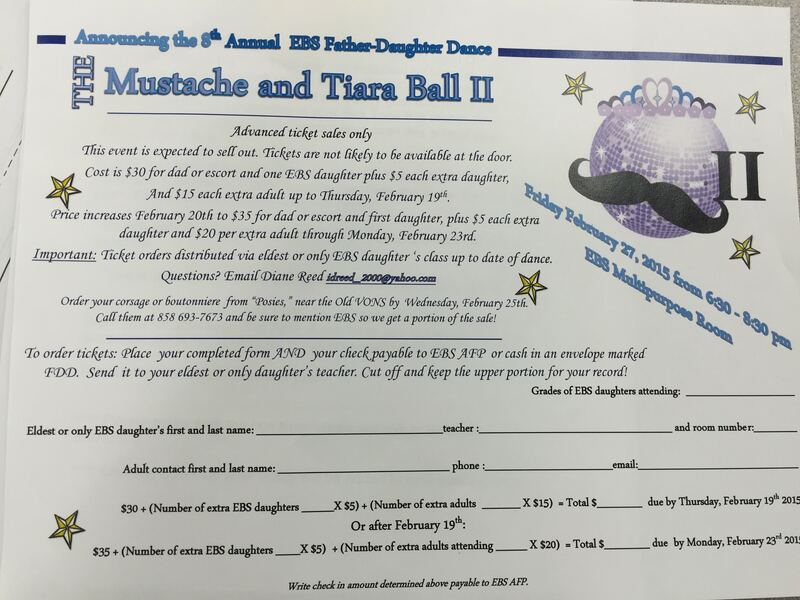 Registration went out recently for the Father Daughter Dance. If you are interested in going, please make sure your turn your registration in. See a picture of the registration below. Jog-A-Thon information went home Thursday. We are still in need of coordinator for this event. Please consider helping our class out by volunteering to be our liason/coordinator for this great event! 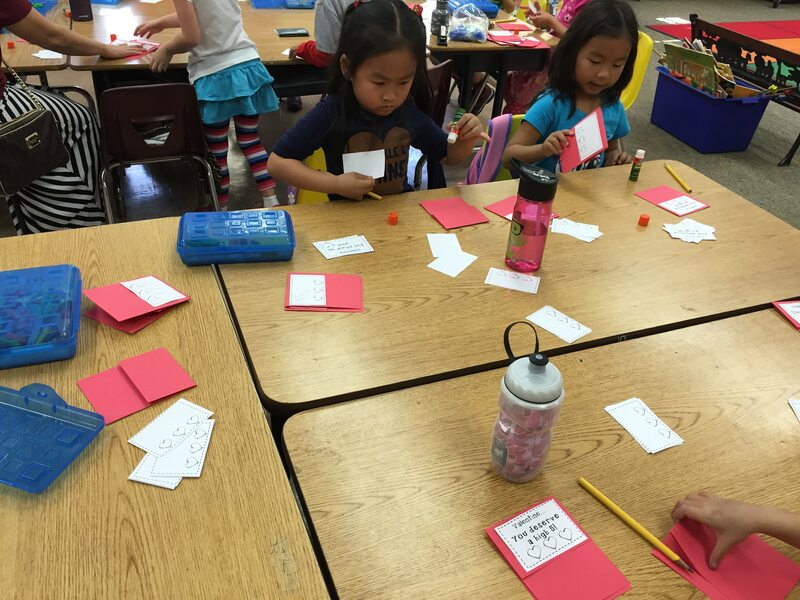 Each child should have received a packet with a personalized envelope. If you think you would be able to help on or before Friday, March 6th please let us know! We could really use your help and your child would be thrilled! 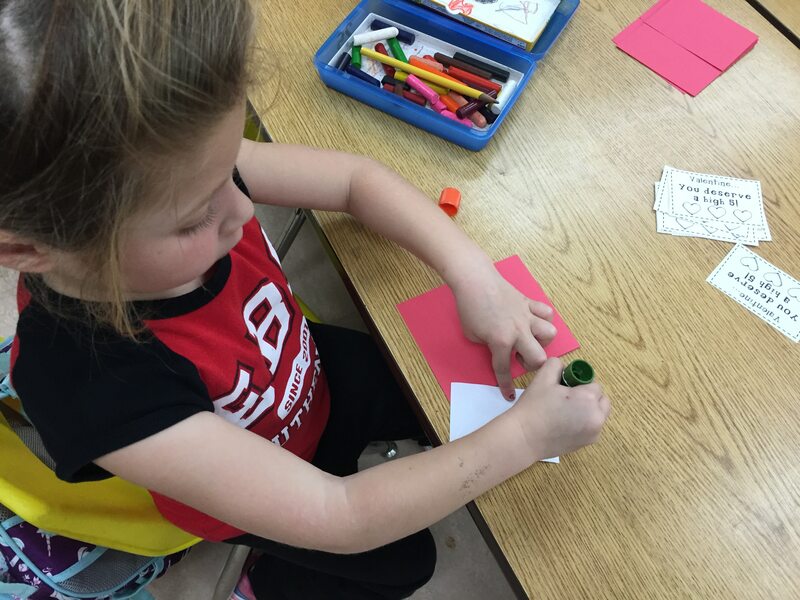 Thursday we had our Valentine Celebration! What a day! The kids were so excited to pass out their valentines and had a blast playing Bingo, and making their Heart Butterfly/Pencil craft! Thank you to all the parents that came out to help and join in the fun! 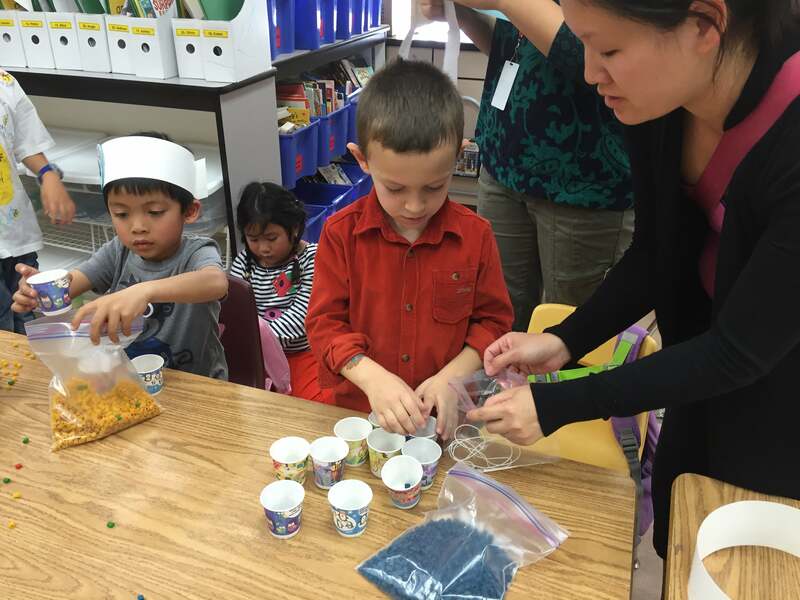 A special thanks to Megan Brenk and Soya Lee for organizing all the fun! 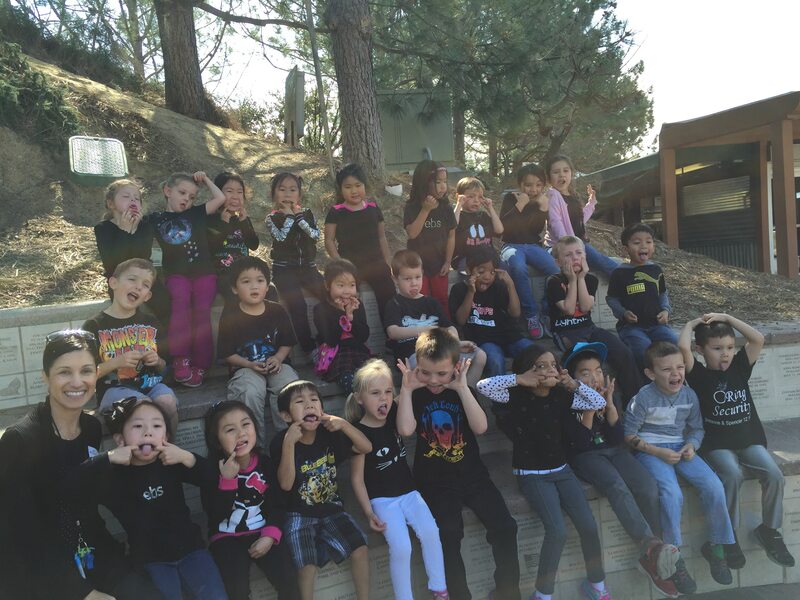 Wednesday the kids were so excited to celebrate 100 days of being in school. 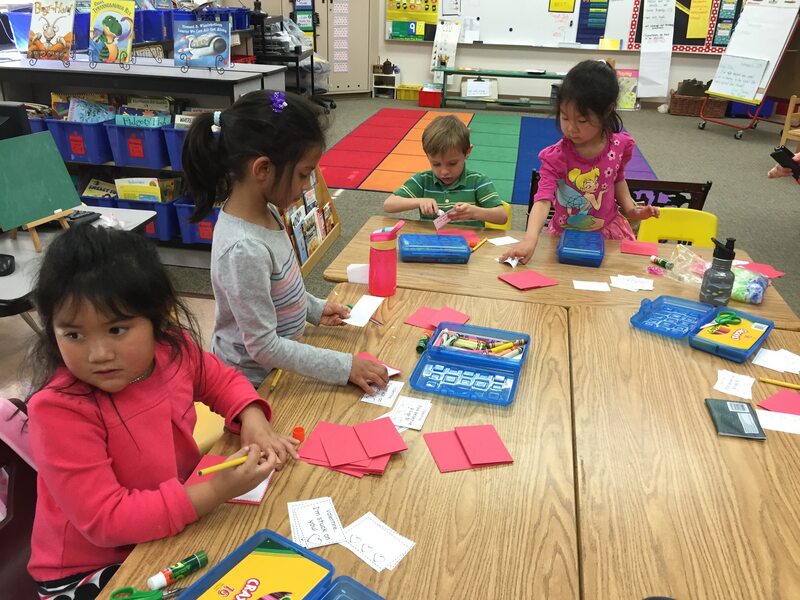 We had 5 stations the kids rotated through. 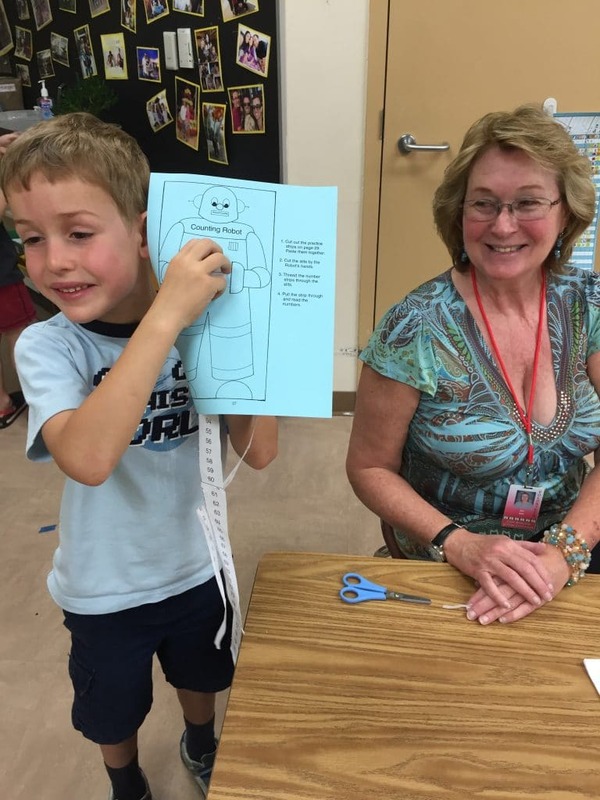 Station 2: The students cut out a robot that counted from 1 – 100. Station 4: The students counted colored pasta to make a 100 bead necklace. 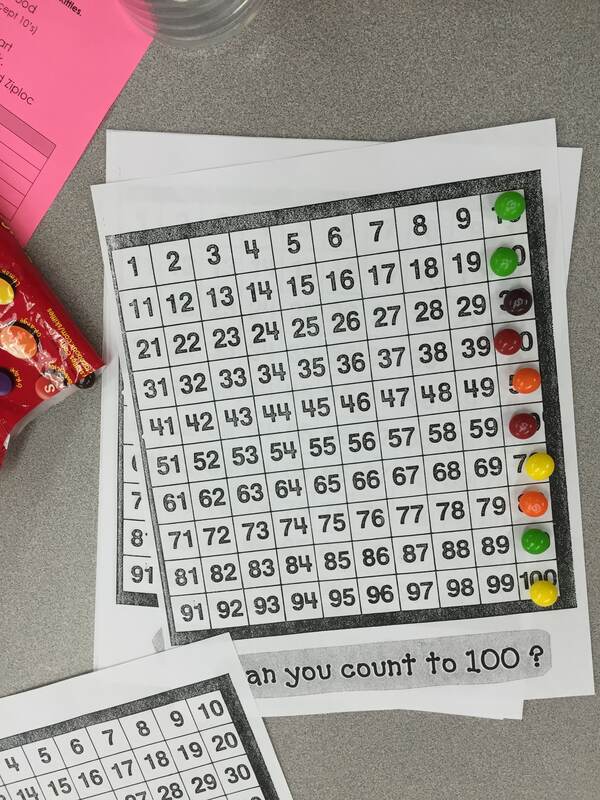 Station 5: The students used a counting board to count to 100 using Skittles for the 10’s (which they got to eat after). In addition we wrote about what we would do if we had $100. These are posted in the entrance of the classroom. Special thanks to our Soya Lee, Jan Ash, and Alice Sestok who came in to help run the stations! We couldn’t have done it without you! 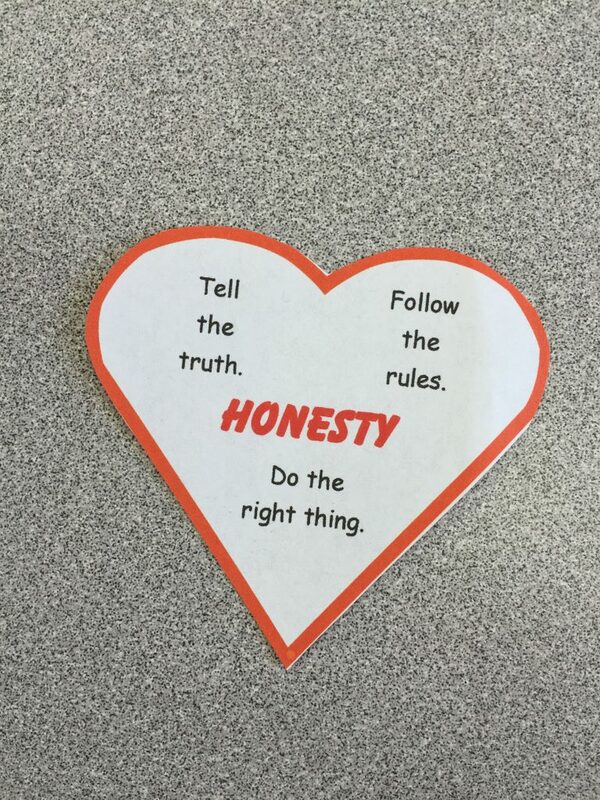 Jan Ash (one of our wonderful grandmas) came in to teach the students about this month’s trait of HONESTY. She read a book to them and played a little game of True or Not True. She spoke with them about how it feels inside when we don’t tell the truth and the importance of honesty in our relationships with others. She gave them each a “heart” to remind them how it is important to be honest in our hearts. 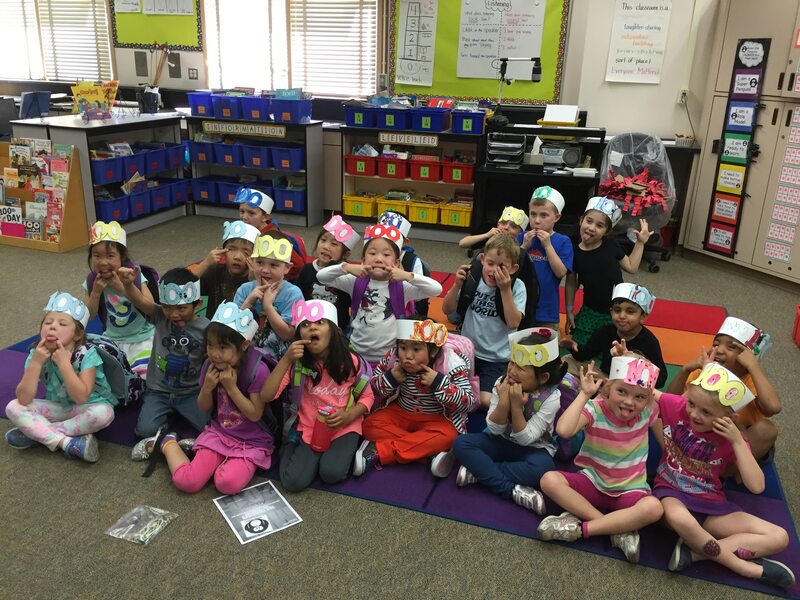 What a great and busy 100th day we had yesterday! This week is packed with FUN! Please only fill in/write the “From: ___” on each valentine as each student has to deliver to 26 bags. 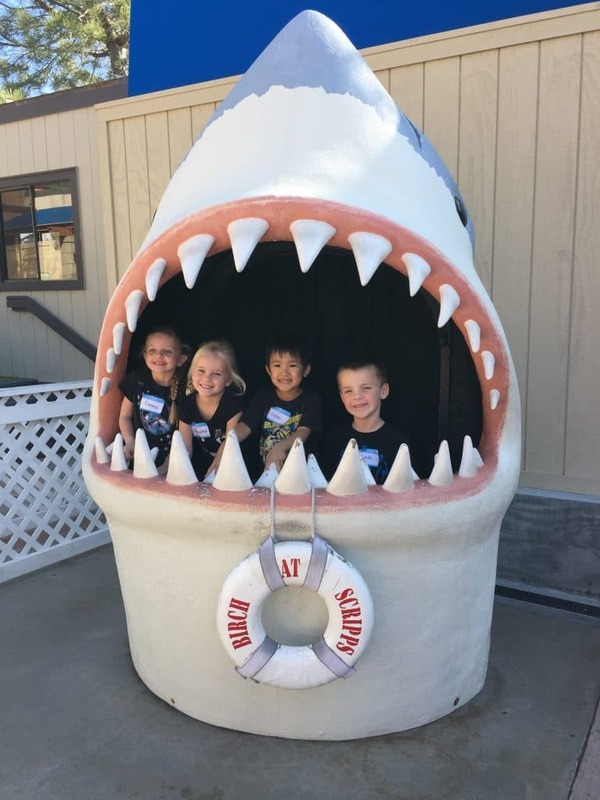 DRIVERS – If you are a driver for our field trip on Tuesday, don’t forget to return, your license, copy of insurance and money today (Thursday, Feb. 12). All drivers can meet at the classroom at 10:00 on Tuesday the 17th to pack up and load carseats. Don’t forget to pack a lunch for yourself. STUDENTS – A flyer will go home today to remind students what do bring and to wear black! There will be 3 other EBS classes with us, so our class is wearing BLACK to distinguish us as 206. Please make sure your child’s lunch is disposable. Don’t forget your carseat. COOLER NEEDED – We are great need of a large cooler for to store our lunches in for field trip. If you are driving and able to bring a large cooler that would fit 26 disposable brown bag lunches, please let me know tomorrow. This week I was out for 3 consecutive sick days (a record in my teaching career). It was a long, rough week as my body was beat and is still weak! I’m still on the road to recovery, but am so grateful to be back and for your support and flexibility as I was attempting to get well. I am grateful for your understanding and missed those kiddos. Monday of this past week, your student received direction/clue sheet with a green rubric attached and a brown paper bag and a due date slip inside. Don’t forget this is due on Monday (February 9th) as we will begin student sharing presentations that day. We are aiming to finish the presentations by Wednesday, but may need to do some on Thursday as well if we run out of time. Don’t forget to practice the oral speaking part many times with your child so that they are able to read or remember their clues independently as well as practice being loud and clear. I can’t wait to see the great ideas coming on Monday! If you haven’t returned your permission slip please return ASAP! I’m missing a couple student permission slips and we are trying to get all the details out and confirmed during this week as we have a long holiday weekend coming just before our field trip. All Field trip info must be in by MONDAY! Thanks! I’m so proud of 206! They are so generous! 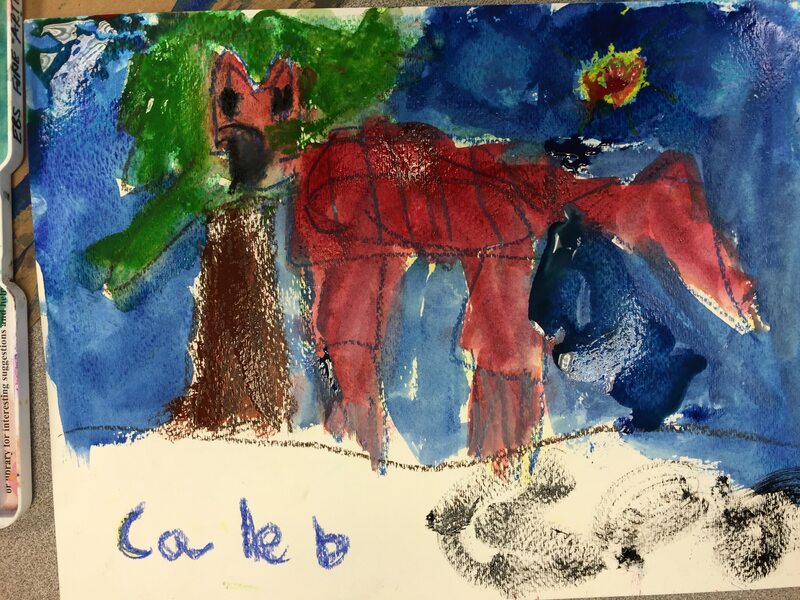 We read a book all about Caring. When I first asked the kids if they knew what “caring” meant, they started to give examples of “carrying.” It was a funny little moment that I hadn’t expected and explained the difference between the two. We read a book all about a variety of examples to show that you care. After reading the book, we each wrote how we can care for others. Shortly after recess, we followed the book and writing up with thinking about kids in the hospital. This took a little explaining, but they quickly got it and started to understand that some kids don’t get to go to school or sleep in their own bed at night because they have to stay in the hospital for periods of time. After a good talk we explained this heart goal and how we were going to help and give to others. 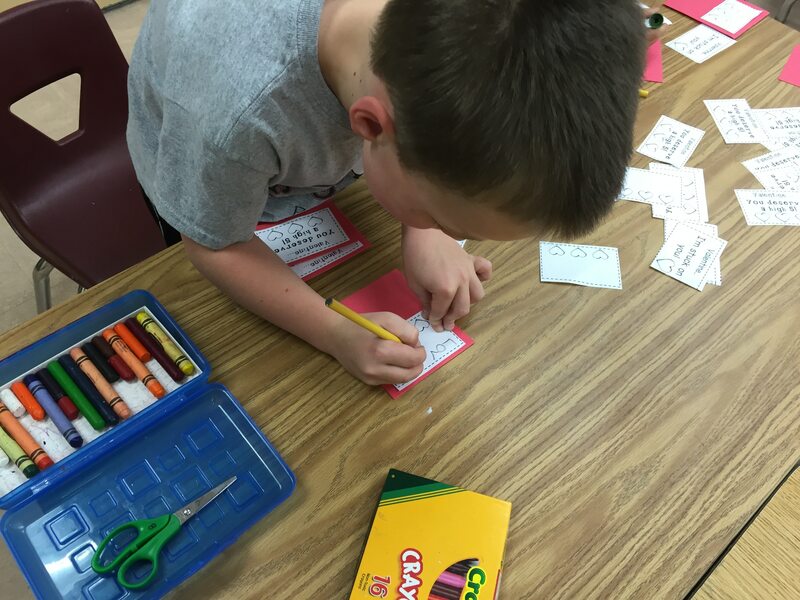 I showed them the sample valentine and explained how we were going to make 200 valentines for many of the kids in the hospital. After explaining the task the kids got to work! They were like mass producers! They did such an awesome job of putting these together to help other kids. I’m so proud of these guys! We also had some AWESOME MAMAS come out to help us! Thank you Amy Ju, Cathy Sin, and Alice Sestok and to Megan Brenk for organizing all the help while I was ill! We couldn’t have done it without you! 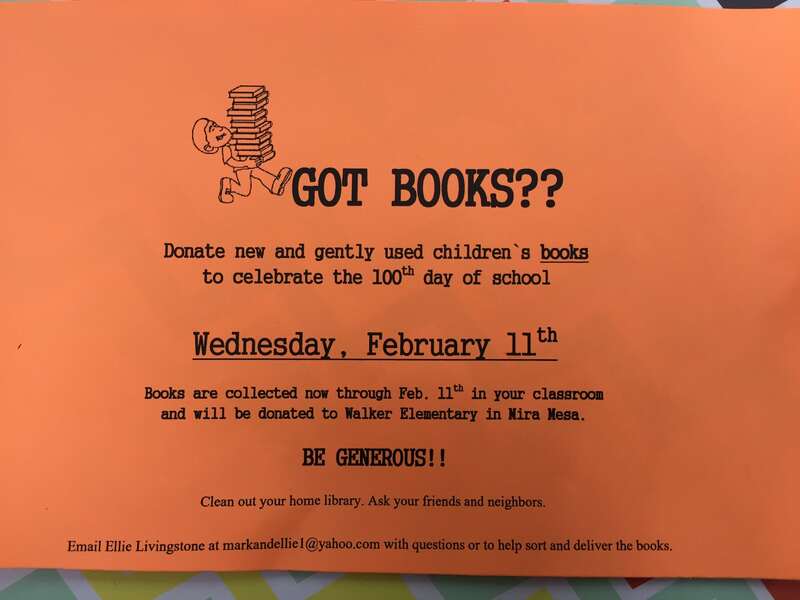 On Monday an orange, half-slip flyer (pictured below) is going home regarding the book drive. All books are due this Wednesday, February 11th! The bag is just inside our door if you want to drop your book of yourself. If not, we’ll add in the bag during class. See details below. 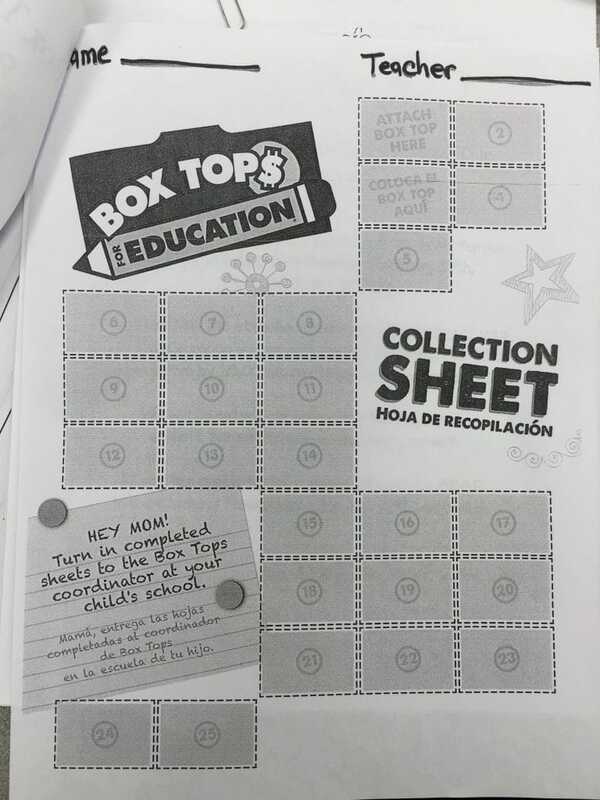 The former information given out in AFP minutes were incorrect regarding the next round of Box Top collections. No new date was given, but should be coming up in a couple of weeks! I’ll keep you posted when I hear any updates. Hang on to those labels and keep on collecting! In addition to these sounds and words, we talk about the formation of the letters and correct capitalization. Here’s a student sample from Friday. 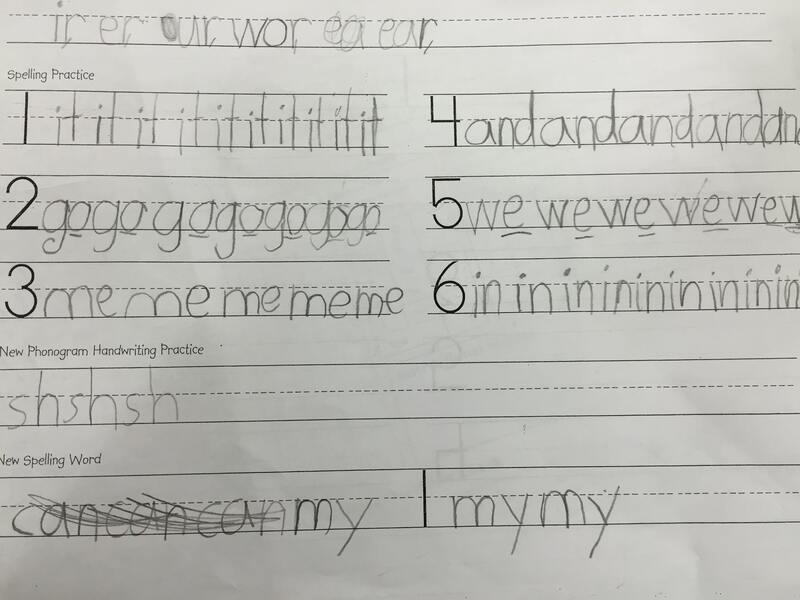 (we underline letters that say their name and are proud to be mistake-makers! 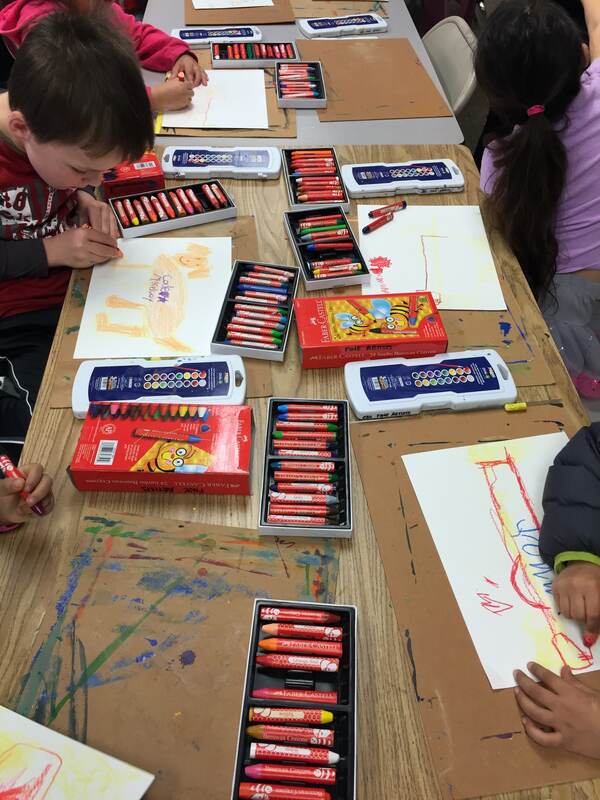 This past Friday we were able to get our Fine Artists lesson drawing dogs! Thank you to all our Fine Artist Volunteers (Angela Weathers, Jennifer York, Megan Brenk, and Jan Ash). 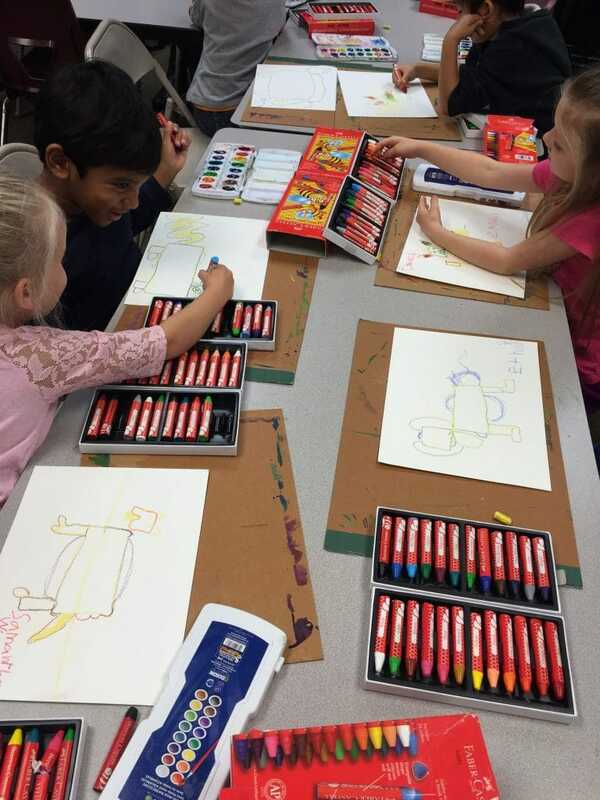 The students used a yellow Beeswax Crayons to sketch a dog using shapes. They traced the dog with colored crayons. Then they put the dog in any place of their choice by drawing the surroundings of their dog. 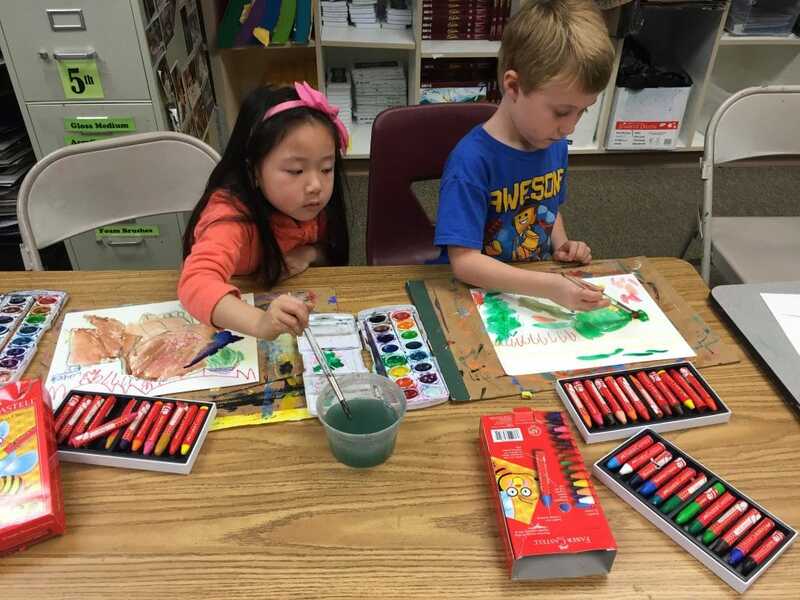 Then they painted their dogs using water colors. 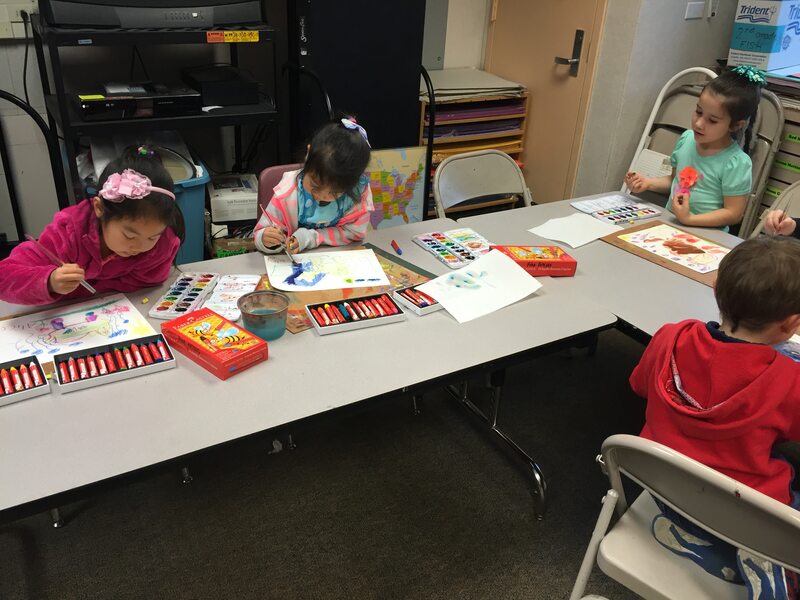 Check out some pics of your little artists at work! In addition, O’s Kitchen is having a Family Night Out with 20% off. Help to celebrate and support our school! 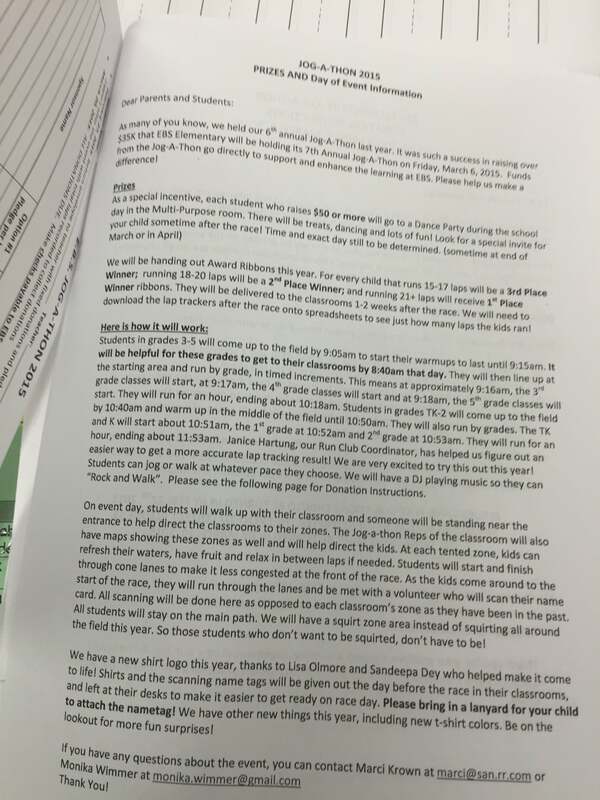 You each received a form today regarding a Bus Drill. 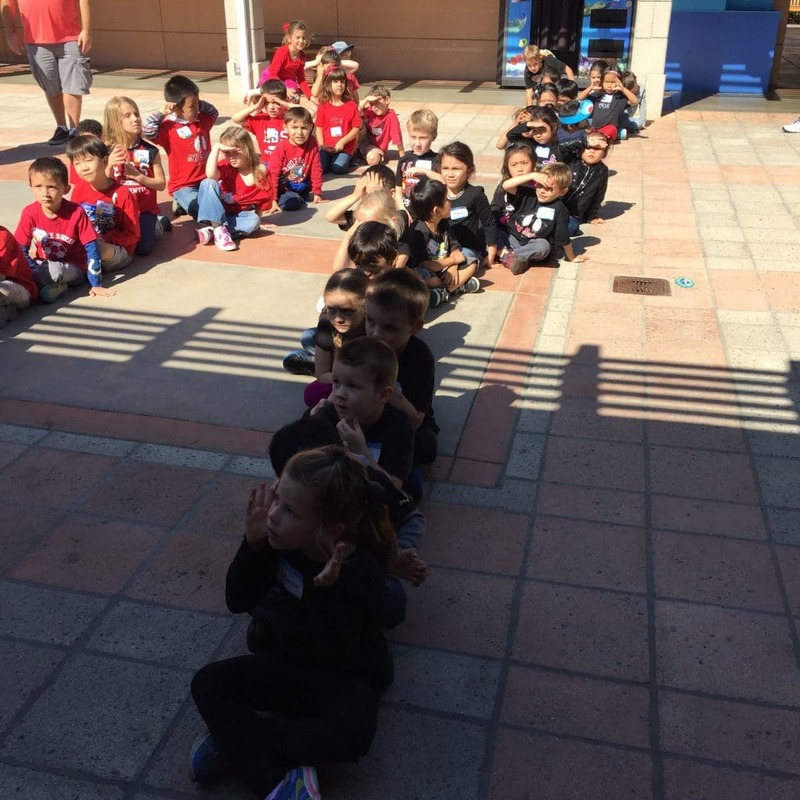 This is an annual drill where students all get on a bus to hear about Bus safety. 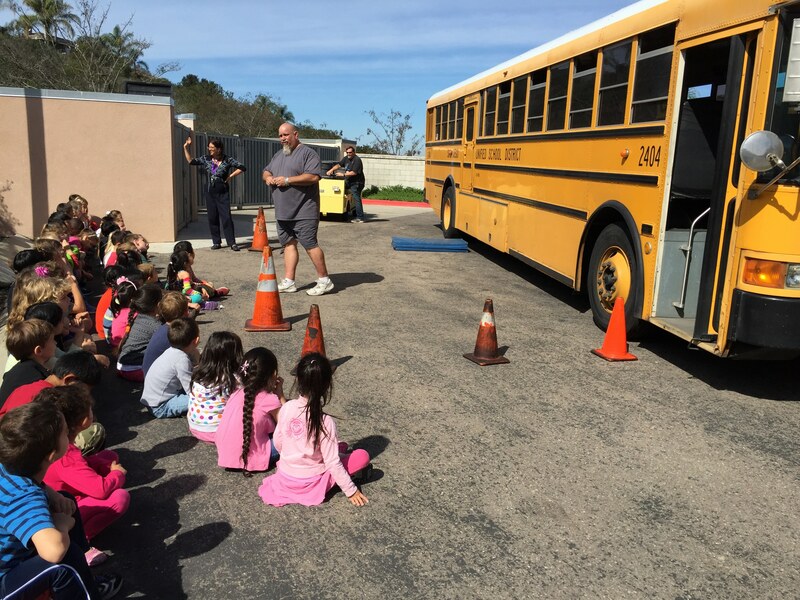 The Bus driver speaks to the students about the dangers and solutions off the bus and on the bus. The form only needs to be returned if you don’t want your child to participate. We will participate on the bus drill on February 18th. 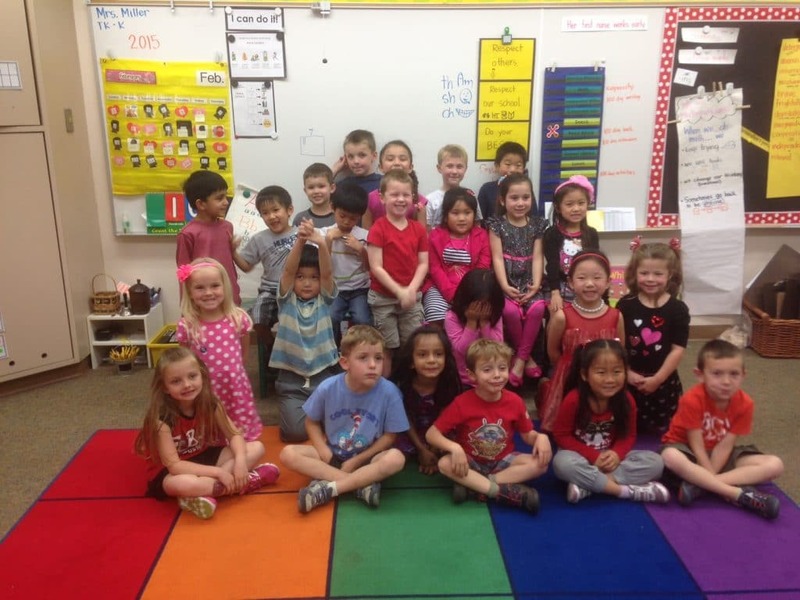 Thank you so much to everyone who volunteered in our classroom in January! I can’t tell you how grateful I am for the contribution of your time and effort. If you would like to volunteer during the month of February, please let me know the date and time you are available and I’ll add it to our February Volunteer Calendar. After a little scare at my home, I was reminded how fortunate we are to have good health and how grateful we are for health care providers. In an effort to teach to the heart/soul our class will be making 200 Valentine’s to donate to Rady’s Children’s Hospital. I will be reading the children a book to start the discussion. I plan to tie this into our regular conversations about giving to others (generosity), and starting the conversation of remembering those who are sick and finding a way to care and bring smiles to the many who will be in a hospital on Valentine’s Day. We will assemble as many Valentine’s as we can next Friday (Feb. 6th). If you are able to join us and assemble we’d love to see you! We will be assembling at 11:30 am. 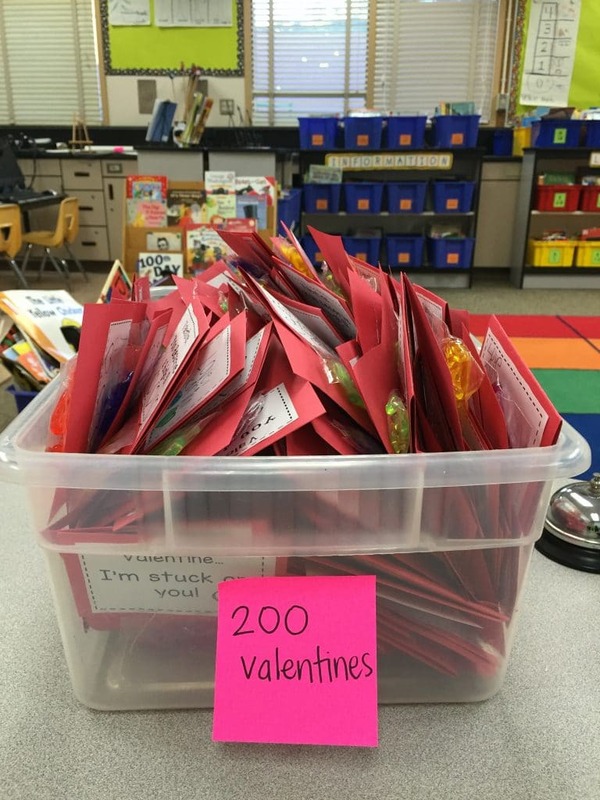 Please only fill in/write the “From: ___” on each valentine as each student has to deliver to 26 bags. Thank you. 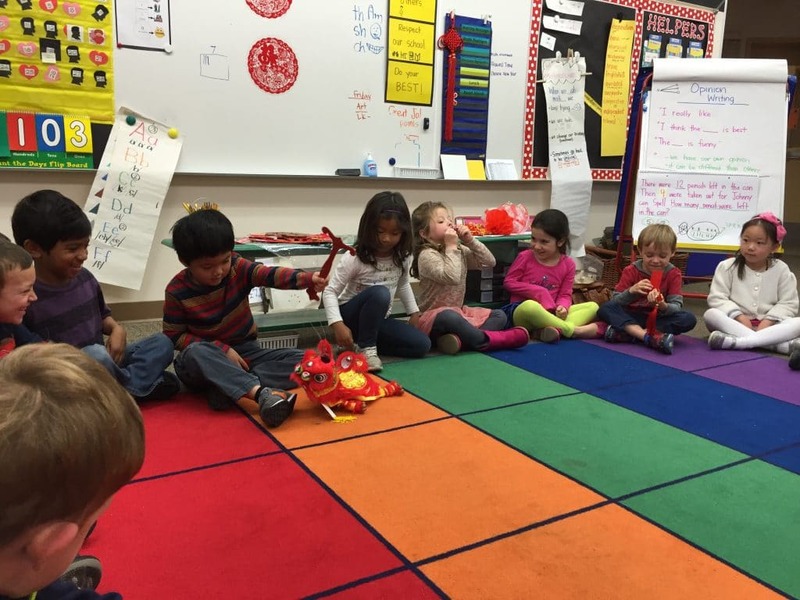 In addition to all the other festivities….we are quickly approaching our 100th day of school. Each day we add a dot sticker to our 10-frames and count the number of days we have been in school (we used to count by 1’s, 5’s and 10’s, but as the numbers grew we now only count from 5’s or 10’s and only count by 1’s from a random small range of numbers). This is an exciting day that has been coming with a build of anticipation! This fabulous day falls on Wednesday, February 11th. We would love some volunteers from 11:15 – 12:30 pm to help out with a rotation of centers we will be doing. If you are able to volunteer and are cleared, please stop by and sign up in the hallway of 206 this week. 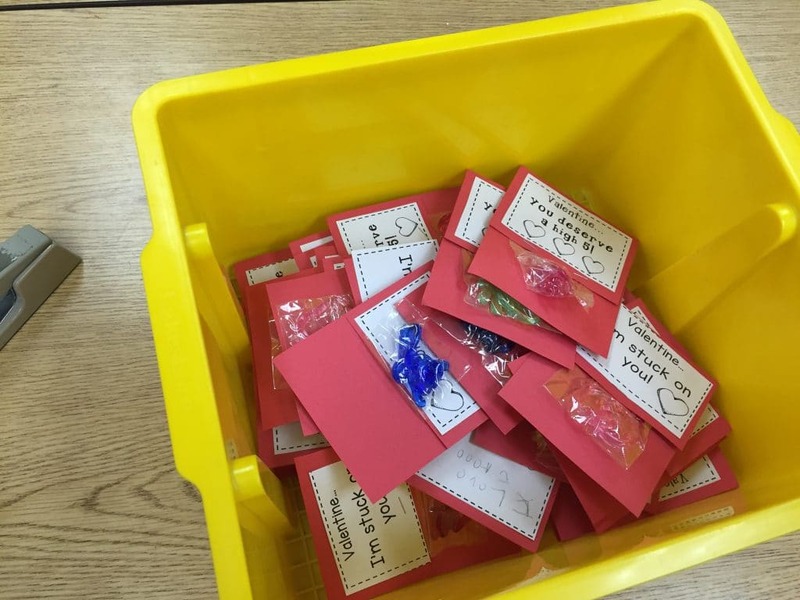 Day 100 Sharing – as another way for student to practice listen and speaking skills, students will be bringing in a small collection of 100 things that fit in a small bag. Be thinking of some ideas with your student. The focus of the activity will be on the oral presentation. A sample rubric will be attached so you can practice at home. Information for sharing will go home this Monday. 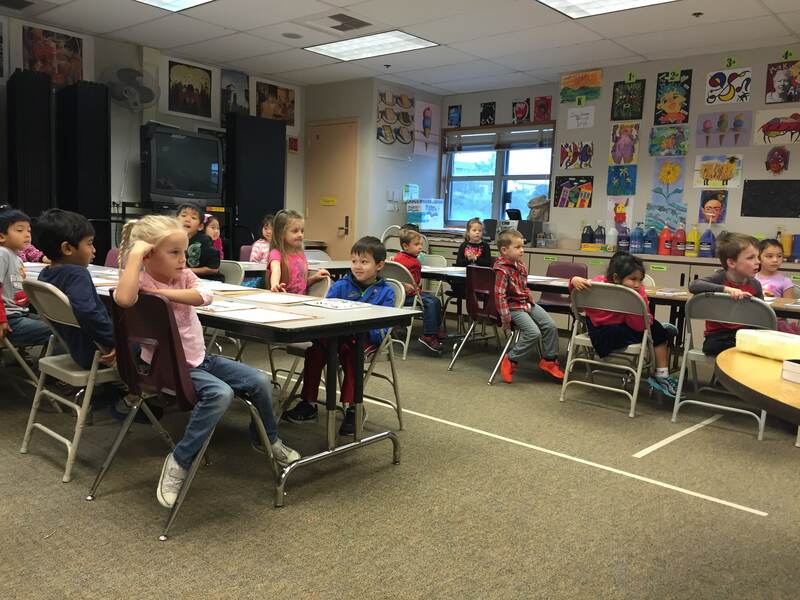 Each week, I get an email of the RAZkids activity and noticed only 10 percent of our class is using RAZ kids. 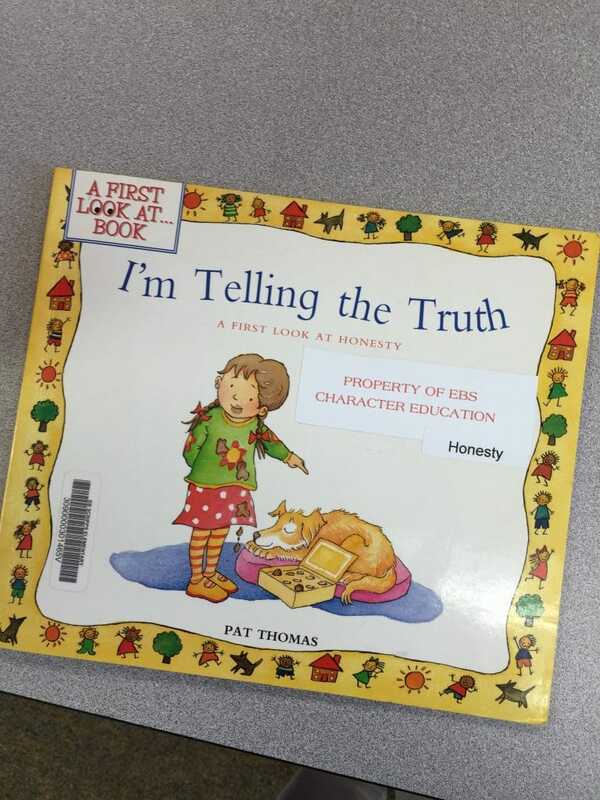 I have blogged about it before and spoke to each family about it at conferences, but wanted to make sure that each family remembered about this amazing reading program that is free for all EBS students. This is another one of the wonderful purchases made by our generous AFP (that’s you guys!…thank you!). I spoke with the kids about it this week and challenged them to go on the computer and read each night for 10 minutes before dinner time. The next day almost half of our students got on RAZ kids. We are trying to commit to reading a little every day and raise our stats to build consistency for reading growth and to enjoy some great books! Let me know if you have any questions. Remember this is an independent reading activity, so it allows you a little rest and your child gets to practice reading (fiction and non-fiction). This can also be logged on your Homework each week in addition to the Bag of Borrowed Books. Here is a direct link to my Links page (under Info & Resources) tab with all the directions! 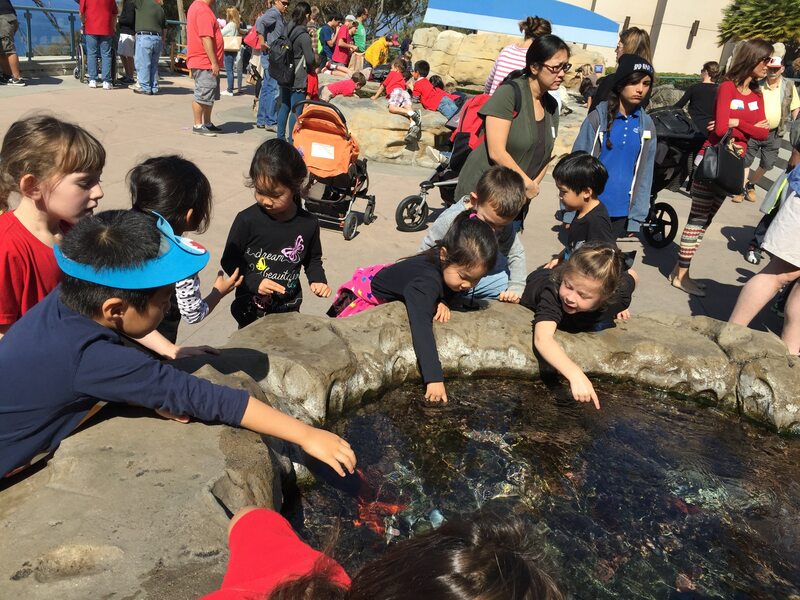 Just a reminder that info packets went home this week regarding our Field Trip to Birch Aquarium on February 17th. Please return the payment and permission form for your child. We are limited in the number of volunteers we are able to take on this field trip as it is based on adult to student ratio. Due to this constraint we are trying to give priority to parents that can hold many children in their car (4-6) and/or weren’t able to come on the last field trip. Please let me know if you are able to join us on our field trip. Box Top collecting has started! Spot them on your products at home, cut them out and bring them in to raise money for EBS. There are also school prizes for top collectors. There are many important dates this month that I thought I’d list them here. These are also listed on the Calendar Dates page. If you have any questions regarding any of the dates/activities, please let me know. Thank You! 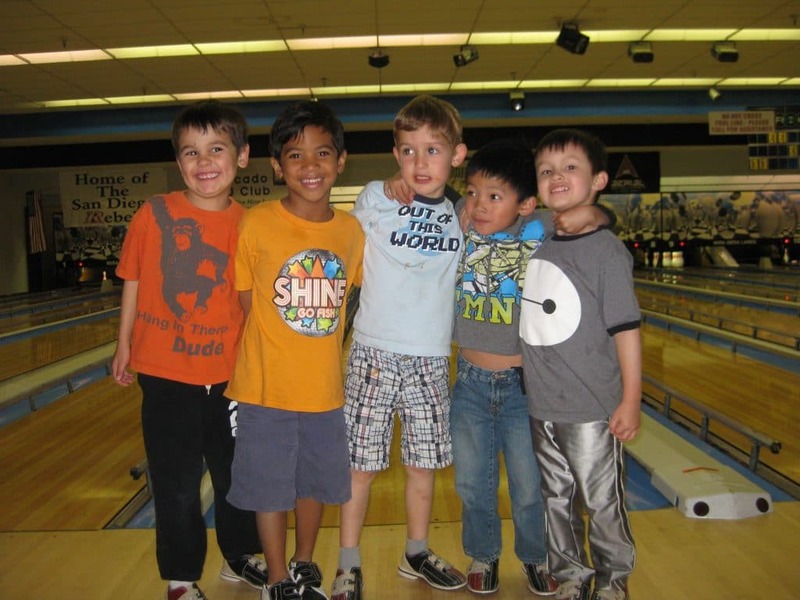 Not sure if any mamas and their big boys got to attend the Mother Son Bowling event last weekend, but I got to see an adorable pic of the fun and had to share! Father – Daughter Dance is coming up soon (see the Calendar Dates page on our website). 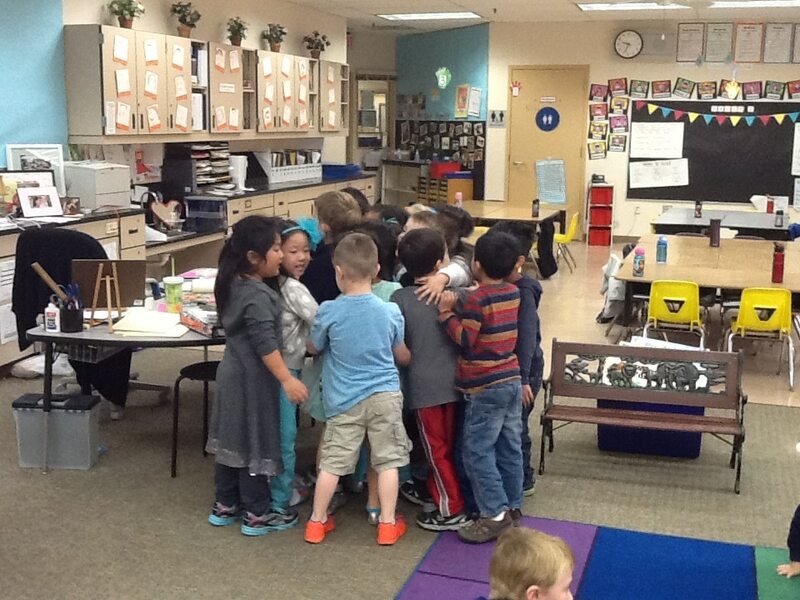 Cute Moments in 206…”Group Hug”! This week, a sweet girl in our class was so excited as her mom came in to volunteer. When it came time for Mom to leave, this little one got a bit teary as she said goodbye. Upon hearing the sadness and consoles of his teacher, another student and dear friend jumped out of his seat with empathy and wrapped his arms around her to comfort her. 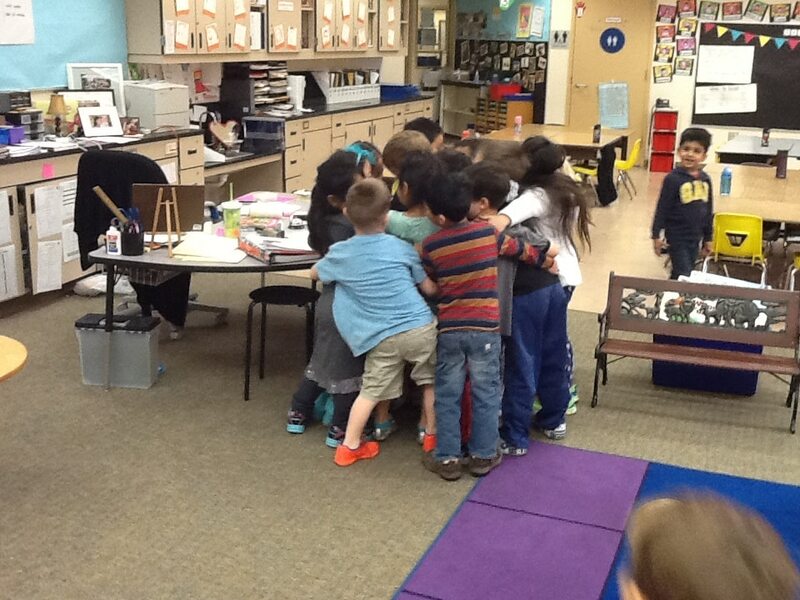 As the others saw this act of kindness, most of the other student gathered around her too and joined in a group hug. 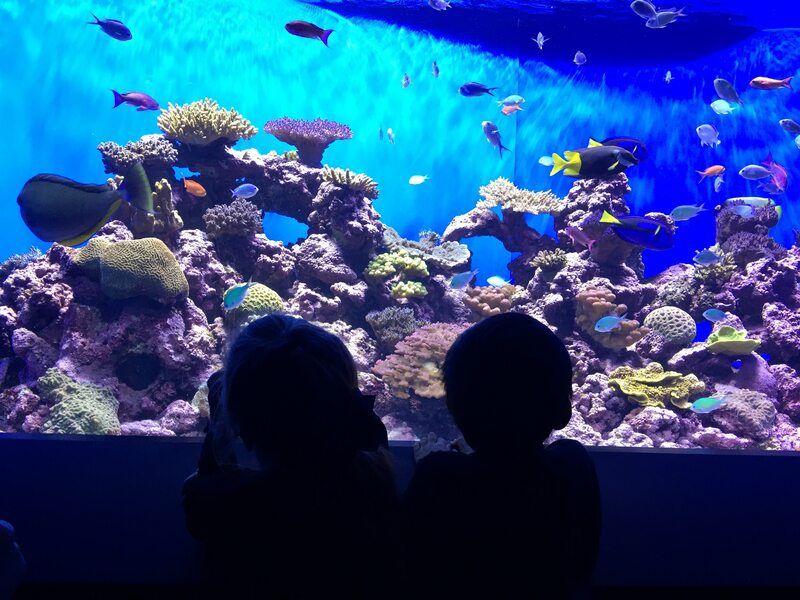 (gets me teary when I see the pic) This was totally unprompted and one of those moments that just made me smile and put me in awe as children have most wonderful raw and loving reactions! …Love these kids! They are special and you have done a wonderful job in raising them! Assemble Rady’s Children’s Hospital Valentine’s at 11:15 am. TK Days - Nov. 28 - Dec. 2 - Linnea Miller on We Have Heart! TK Days - Oct. 10 - 14 - Linnea Miller on We Have Heart!